← More Storms Than Usual This Month, Summer, And Year? The dewpoint is not the relative humidity. The relative humidity is not the dewpoint. Unless you are a meteorologist, you could go your entire life without knowing the relative humidity again. Meteorologists use relative humidity for forecasting clouds and for specific fire weather purposes…and that’s about it. If you only follow one of these two variables, choose dewpoint. The dewpoint is an absolute measure of how much moisture there is in the air. The higher the dewpoint is, the more humid it is. When the air temperature cools to the dewpoint, the air comes saturated. Any dewpoint above 60° suggests it is humid outside; a dewpoint of 70° or higher means humidity is oppressive. The relative humidity is different than the dewpoint. 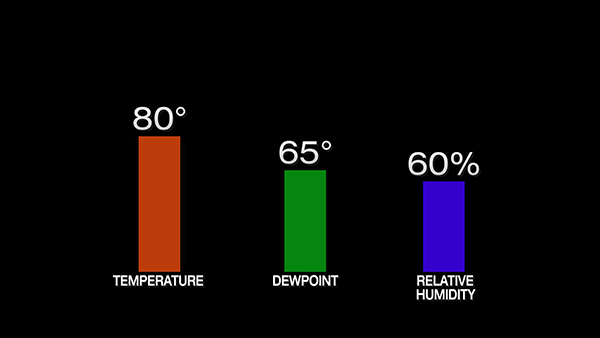 The relative humidity describes the relationship between the temperature and the dewpoint. More specificially, the relative humidity is the amount of atmospheric moisture present relative to the amount that would be present if the air were saturated. If the temperature is close to the dewpoint, the relative humidity will be high; if the temperature is far away from the dewpoint, the relative humidity will be low. 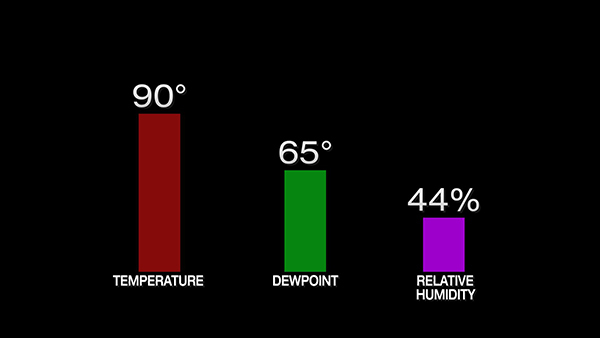 The relative humidity does not describe how humid the air is; the dewpoint does. The relative humidity can be 100% in the winter when the air is far from humid. Likewise, the relative humidity can be below 50% when it is very humid outside. 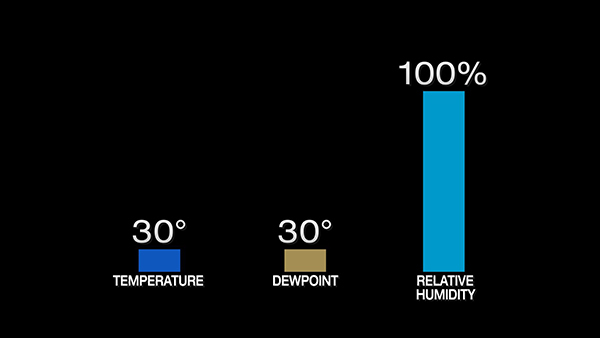 Regardless of what the temperature and the dewpoint are, if the two are equal, the relative humidity is 100%. The relative humidity can be 100% on a humid summer morning or on a very cold winter day. Did the air become less humid? The answer is no. The dewpoint did not change, but the relative humidity dropped significantly; because the dewpoint is over 65°, however, it is humid. In fact, you didn’t even need to know the relative humidity to know whether the air became less humid or not; you just needed to know if the dewpoint rose or fell. Did the air become more humid or less humid? The answer is neither. The dewpoint did not change, so the air is not more or less humid. As an aside, the air may feel more humid when the temperatures rose through the day (even when the dewpoint did not). This apparent temperature – called the heat index – rose because the temperature increased. 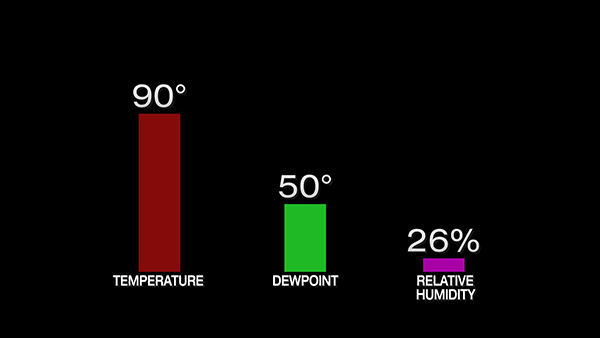 The heat index is only calculated between the temperature is greater than 80° and the dewpoint is greater than 54°. Did the air become more or less humid? The dewpoint rose, so the air became more humid. The relatively humidity rose only in response to the dewpoint rising; because the difference between the temperature and dewpoint went down, the relative humidity increased. The air became far less humid because the dewpoint dropped 20°! The relative humidity dropped only because the difference between the temperature and the dewpoint increased. 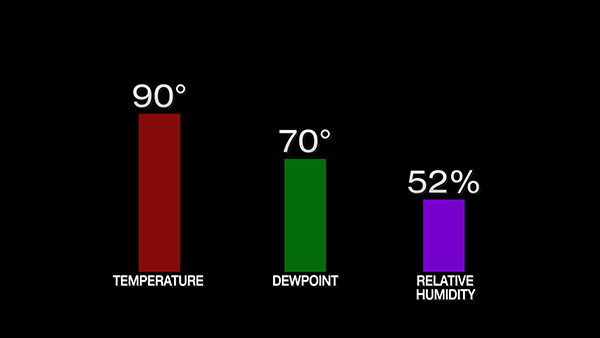 In summary, the dewpoint is an absolute measure of how much moisture there is in the air. The relative humidity does not tell you how humid the air is; the dewpoint does. The relative humidity describes the relationship between the temperature and dewpoint. The relative humidity can drop and fall rapidly through the day even if the dewpoint remains the same. Despite “humidity” in its name, relative humidity is not a good judge of humidity as you feel it; it is a measure how far apart the temperature and dewpoint are. Don’t fall into the relative humidity trap! Relative humidity almost always rises and falls more quickly than the dewpoint. 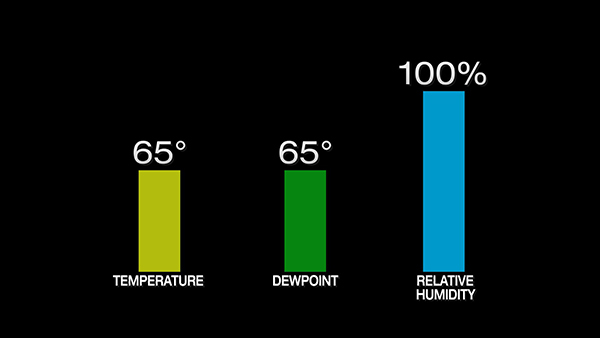 Stick with the dewpoint; it is your absolute guide to absolute humidity!